I finally picked a Spring race. Except that I'm doing the half marathon and not the marathon because I'm not crazy enough to train for a marathon in the winter. This one's scheduled for May 18th and we'll have entire Team /var/run there, so it's going to be a lot of fun. I've been having a tough time figuring out how I want to deal with training for this race. I usually just find a plan with four days of running, and (...wait for it...) run. I tend bypass any plan that has speed work or tempos because I'm not really sure what they are or how to do them. This time I actually wanted to see what my body could handle, so I put out a couple of feelers to some awesome runner friends of mine and asked them what I should be doing. Using their advice, and probably sprinkled with a little bit of over-confidence, I found a plan that will probably kill me, but hopefully I'll get a PR crossing the finish line before that happens. 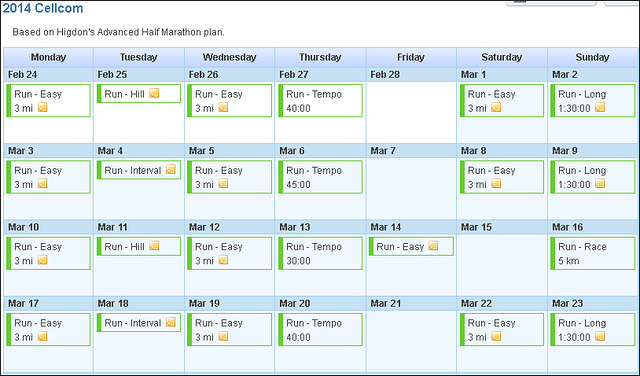 I decided to go with Hal Higdon's advanced half marathon plan. Here's a little snippet, click on it for the full calendar. When I found this plan a few of weeks ago, I knew it was going to be hard, but I tried not to get too freaked out about it. But now that training starts on Monday, and I'm looking at the plan and OMG all the running, and the race is ONLY 12 weeks out - I'm starting to feel a little overwhelmed and anxious. I never really worried about that sort of stuff with my other plans because, ultimately, they were pretty easy. This plan, though, it could be too much running. It could be too hard. I could get injured. Or it could be none of those things. I try to stay optimistic about most things but sometimes when I'm presented with something new, my pessimistic side bubbles to the surface. I think it'll be important for me to stay positive during these next 12 weeks. To do my best not get get overwhelmed, take it one run at a time, and try to stay focused on the prize. My goal is to finish as close to 2:00 as I can. We'll see what happens.